In 2015 the City of Boulder purchased an 8.8 acre site from Boulder Community Health to repurpose as a new municipal campus. The first building slated for occupation was the 21K sf Brenton Building. By re-purposing a medical office building into a city office building the project presented an opportunity to showcase Boulder’s ambitious energy goals outlined in the Boulder Climate Commitment. In the end Brenton was transformed from the worst performing building in the city’s inventory to the most energy efficient. To do this, the city turned the studiotrope/Ameresco Design-Build Team for a turnkey solution. 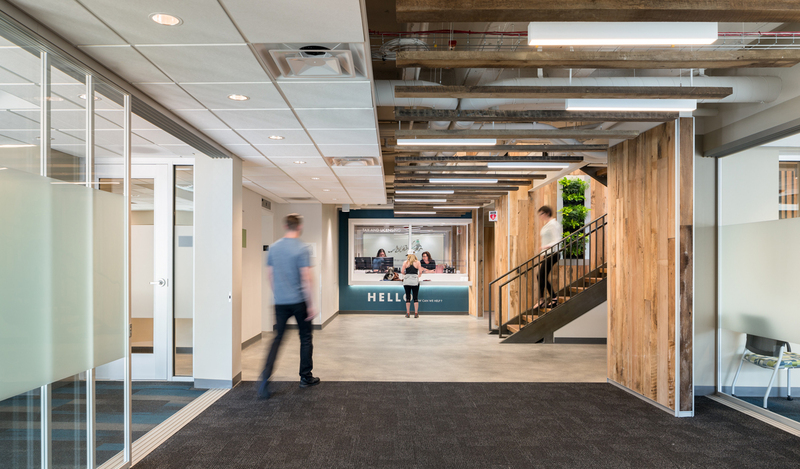 The building’s Energy Usage Intensity (EUI) was reduced from 165 kBTU/sqft to 28 kBTU/sqft, and the interior environment celebrates sustainability with elements like reclaimed wood, a green wall and a repurposed diseased Elm tree from the site for an art installation. Furthermore, building systems were selected with an all-electric approach to eliminate all natural gas usage and the building has a roof mounted 12kW solar array with the goal to add additional arrays to achieve a net zero.